Does your energy bill for your Sacramento home continue to rise each month? Have you considered how to reduce your energy bill, but can’t seem to find a viable solution? At West Coast Solar, we keep solar simple so you can start saving money as soon as possible. We believe renewable energy is the sector that will power our future. In part one of this blog series, we shared the first three tips on how to troubleshoot your high home-energy cost, and in this post, we’ll share the remaining two tips. In most areas across the United States, electricity prices have been on the rise. Sacramento has seen some steep increases over the last few years, and in the last few months, homeowners are wondering if they’ll be able to afford to keep their homes with energy prices continuing to climb. The Energy Information Administration is predicting that the rising cost of energy will continue through 2040. If you’re in this situation, determine if your energy company is increasing prices. Call and discuss with them any alternatives they may offer. You can also look into working with a solar power company like West Coast Solar to design a custom solar system to begin producing your own green energy for your home. Tip #5: Did your electricity service provider switch you to a time-of-use plan? If you’ve noticed a steady increase in your energy bills, you may have been forced to switch to what’s called a time-of-use (TOU) plan. This means that depending on when you use energy throughout the day, your rate will change. In most cases, the later afternoon or early evening hours are considered “peak energy use hours” and the energy companies will charge more during those hours. How do you combat this? Contact your energy company and ask the about their TOU policies, peak hour times, and what the charge difference is based per hour. This information simply means you will need to do the dishes, run laundry, and enjoy your home at different hours throughout the day, if you want to keep your energy bill lower than it has been. If all of the above methods do little-to-nothing to help your electricity bill, consider calling a certified, professional electrician to run an energy audit on your home. The electrician will check for efficiencies, deficiencies, problems, and offer potential solutions. If your meter is broken, it can cause an increase in energy cost. An electrician will be able to check this, identify the problem, and suggest a solution. 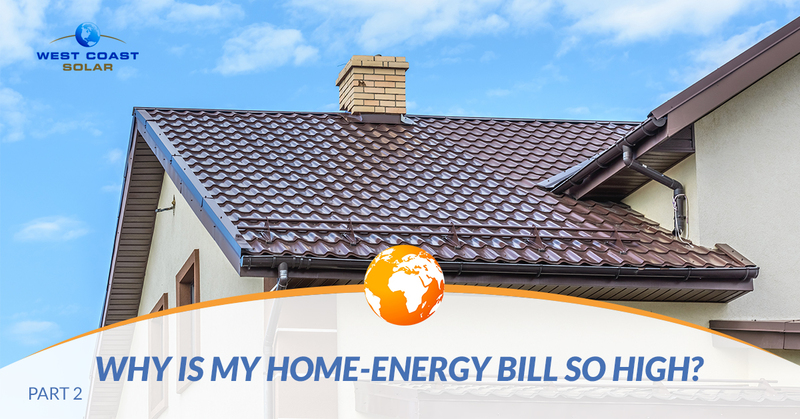 You don’t have to suffocate under a mountain of energy bills. You can do something about it. Your family and your community will thank you when you make the switch to solar power. A solar system offers more than savings on your utility bills; it allows you to help save the environment, create a better future for your loved ones, and energy independence from the volatile energy costs. If you’re ready to discuss making the switch to solar, give West Coast Solar a call today!